For this Iron Craft challenge, we were told to take a lesson from Donna and Tom on Parks and Rec and “treat yo self.” This was the challenge to make something special just for me. I was going to go the homemade bath product route, but I have so much lovely Lush things currently it seemed like a waste. Then I remembered I had a really soft cashmere sweater in a pile of sweaters to donate or use for something else. The sweater was too short for me and had been darned in quite a few spots. I thought about armwarmers or a hat, but that didn’t seem decadent enough. Then I thought of socks, slipper socks, soft, warm cashmere for my feet! These are not slippers to be worn walking around the house. Nor are they socks to be worn with shoes. These are slippers socks made to wear while lounging with a trashy novel eating bon-bons. They are made to be worn while you lie on the couch watching your favorite guilty tv pleasure. 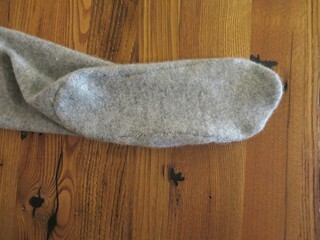 They are the type of thing to throw in your bag when you have a long flight and want something warm for your feet. 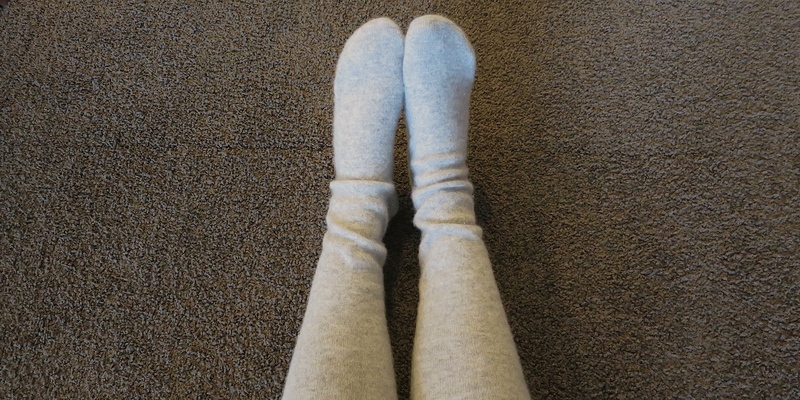 They are perfect for someone like me whose feet are always cold even under a blanket. These slippers used both sleeves and a little of the body of my sweater, but don’t worry the rest will go to good use. I cut the bottom half of the sweater body off in one piece. Once hemmed on the cut side, it will be a soft cowl for winter. 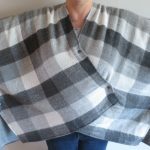 I still have a little of the cashmere left and am thinking of some ideas for it. 1. 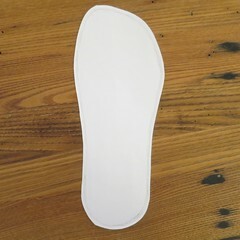 Make a pattern for the sole of your slipper by tracing your foot on a piece of paper. 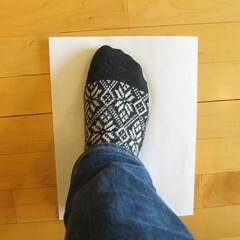 If your feet are pretty close to the same size you can use the same pattern for both feet by flipping it over. This is a step where a second person makes it easier, but you can do it on your own. 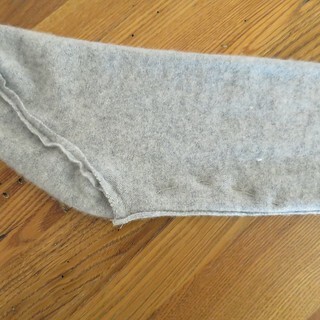 Add about 1/4″ all around your tracing for the seam allowance. Cut out. 2. 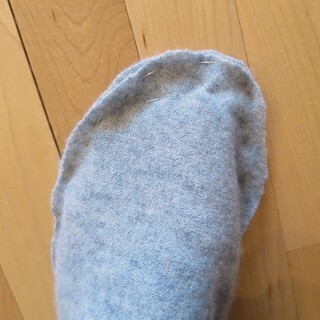 Cut the soles of the slippers out of the sweater body using the pattern. If you pin the pattern through both the front and back of the sweater and cut through both layer, you will have the sole for each foot. 3. 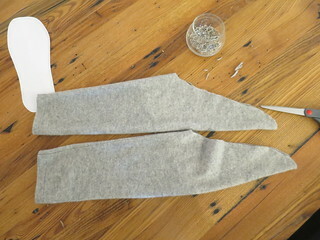 Make the legs and top of the feet from the arms of the sweater. 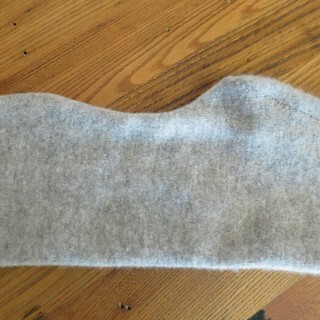 Put a leg in once sleeve and pull it up as high as you want the slipper sock to go. (My sweater did not have a ribbed cuff, so I made extra sure to pull it up high enough that it would stay up. A ribbed cuff would certainly stay up a little better.) Decide if you want a little bagginess around the ankles. 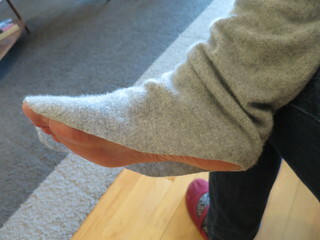 Use the seam of the sleeve as the back of your sock. 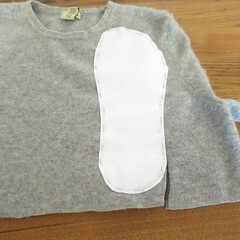 Then cut the sleeve so only the sole of your foot shows. This is another part where a second person would have made it a lot easier. Use that cut sleeve as a pattern to cut the second sleeve by turning it inside out and slipping it over the other sleeve. Pin it in place and cut the second sleeve to match. 4. Attach the soles to the slippers. 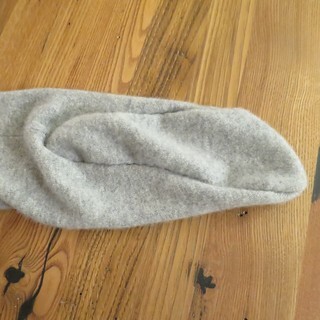 Turn the legs of the slipper socks inside out. 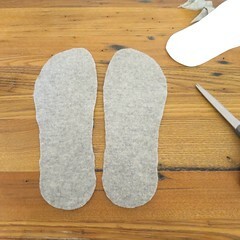 Pin the sole to the bottom of the leg. Match the center of the heel of the sole to the seam on the back of the leg. Now try the slipper on. Since it is inside out, you will be trying it on the opposite foot it will end up being for. Make sure the foot is as snug as you would like. Mine were a little long, so I pinned where I wanted them to end and cut off the excess. It is better to have them be too big than to small. 5. 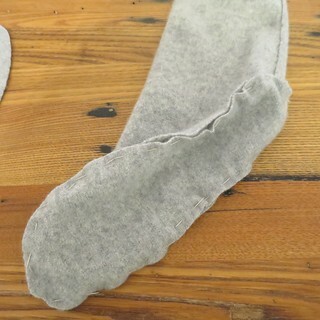 Sew the sole to the leg with a 1/4″ seam allowance. You could do this with a machine or by hand. Just make sure you are doing small enough stitches to keep the sweater from unraveling. I basted mine together by hand. Then I turned them right side out and did tiny little whip stitches all along the seam. Here is what it looked like after basting. And here is after the whip stitching. 6. This next step is completely optional, you can just leave the slipper as it is, I found I wanted it to be a little more fitted around the ankle. I didn’t want it tight, just not so baggy. Turn the slippers inside out and put one on. (Once again, you will be putting it on the wrong foot.) Pin where you want the ankle taken in along the back seam. You want it to be a gradual curve towards the top of the calf. Use that slipper to pin the same curve on the other one. Use that pinned line as a guide to sew that new back seam. (I marked the line with a dressmaker’s marker.) 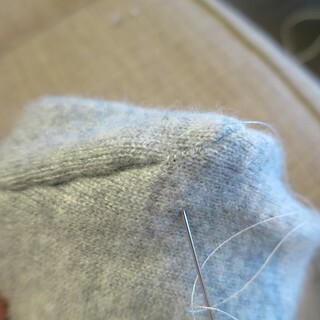 Trim the slipper about 1/4″ from the new seam. I did not add anything to the bottom of these to make them non-skid, I don’t intend on wearing them for walking around much, but you could, of course, add something. I’ve seen people suggest putting stripes or dots of hot glue or puffy paint on the bottom of knit slippers for traction. I haven’t tried either, but it sounds like it would work to me. 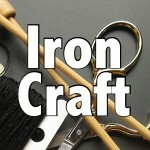 4 years ago by Kat in Challenges , Iron Craft , Needlecraft , Projects , Sewing , Sewing Projects | You can follow any responses to this entry through the RSS feed. You can leave a response, or trackback from your own site. Gorgeous. I have an old ribbed cashmere turtle neck which doesn’t really fit me anymore but I haven’t been able to bring myself to get rid of it. Now I know why! A ribbed version of these would be great as they would stand up nicely. Yes, though it might not be that comfortable on the sole. I shall experiment. Perhaps you have another non-ribbed sweater you want to get rid of, one for the sole, one for the legs. Or, I was thinking I might line the sole with something. Which might also add to the warmth and longevity of the socks, if I can find the right something. Such a practical project. I really admire your ingenuity and your ability to think outside the box. Well done once again. Very ingenious! I have this Pinned now as a possible approach to make doll boots.